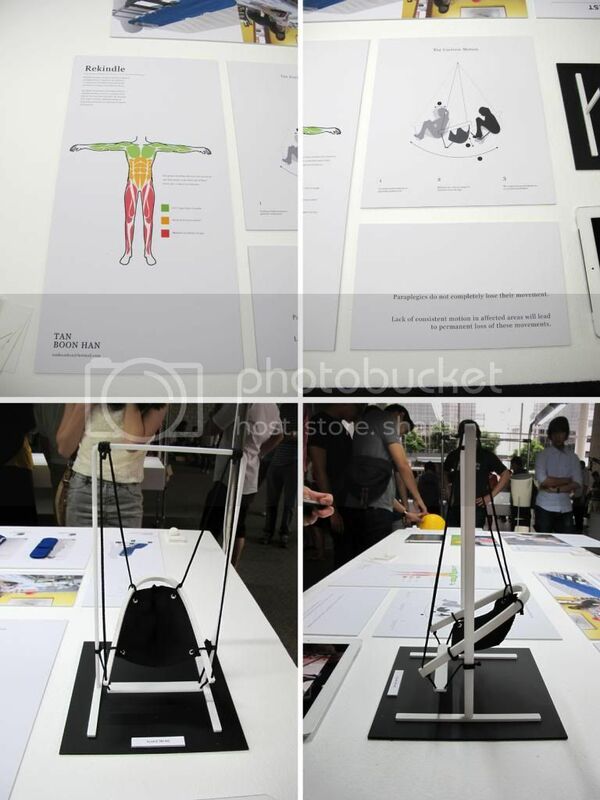 Hi guys, sorry for the lack of updates about the Singapore design scene, but fret not, there is an upcoming event for the NAFA 3D design graduation show next week, if you guys are free, do drop by and check out the students works. 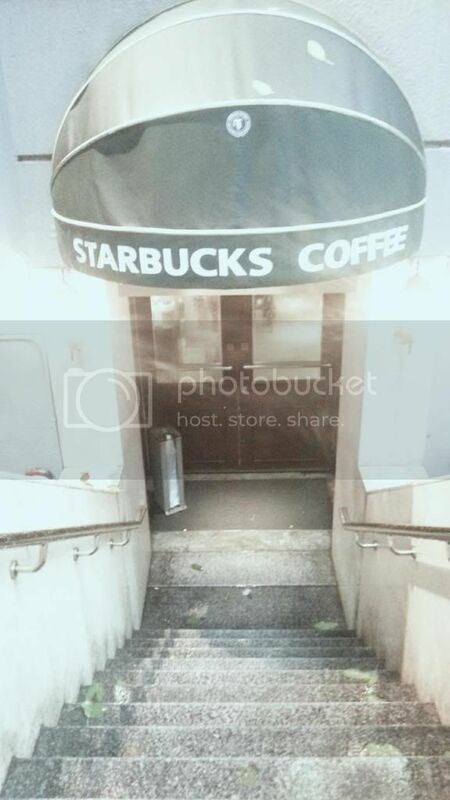 Anyways, this post is actually about 2 Starbucks concept stores in Hong Kong. Not sure if you guys have visited these stores before, but they incorporate the olden day elements of Hong Kong into the stores making it a different experience altogether. The first store, Bing Sutt- - When Starbucks Meets G.O.D at Duddell Street. This Starbucks is designed to look like the 1950s Hong Kong arts and culture, a collaboration with Douglas Young's concept store G.O.D (Goods of Desire). The Exterior of the store. 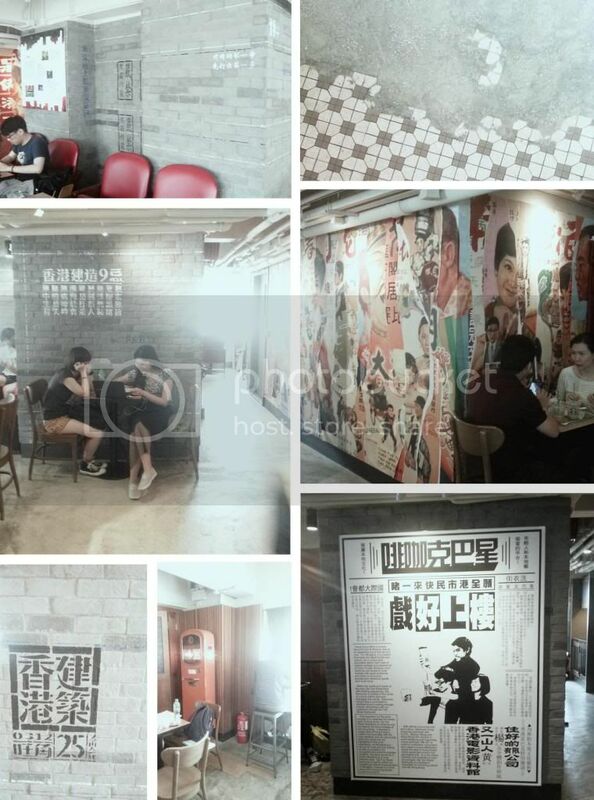 The store is divided into 2 halves - fusing together a retro style with a contemporary coffeehouse design. Everything about this store is just so exciting. 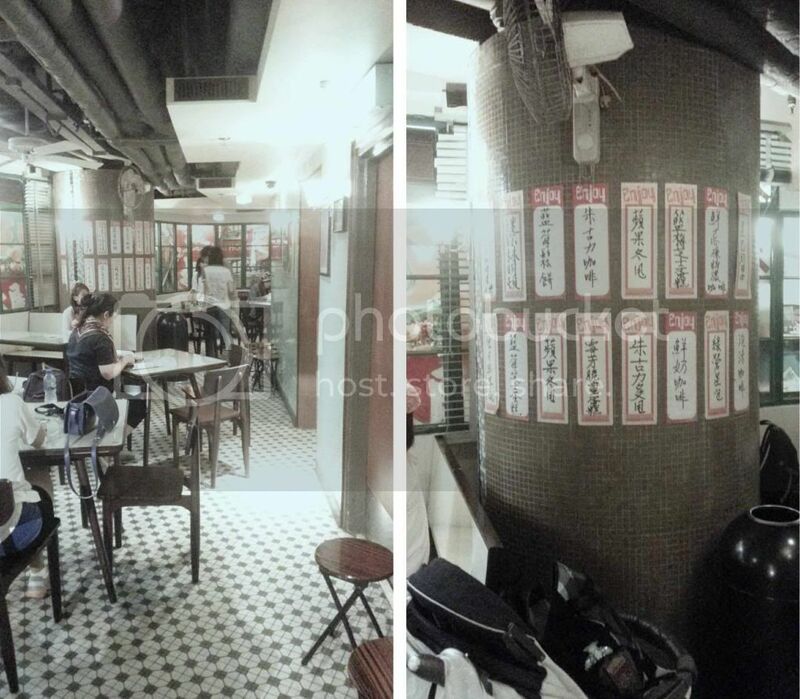 The tiled floor mixed with concrete, the over-the-top decor, traditional Chinese writings, fake windows that shows display of olden days items such as toys and retro movie posters, even fake bird cages hanging from the ceiling! 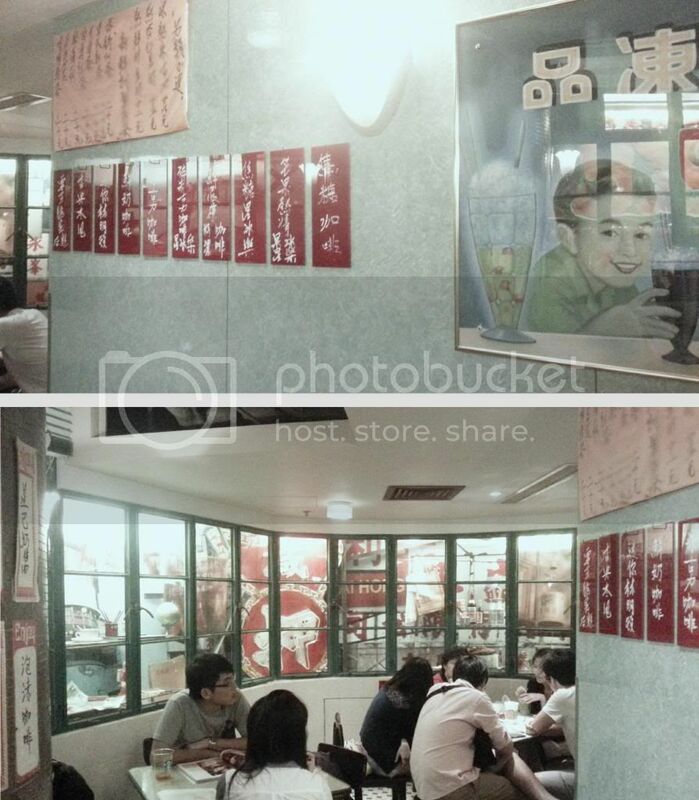 The retro side of this Starbucks is being recreated just to look like an traditional Hong Kong cafe! But, the other best thing beside the awesome looking decor? 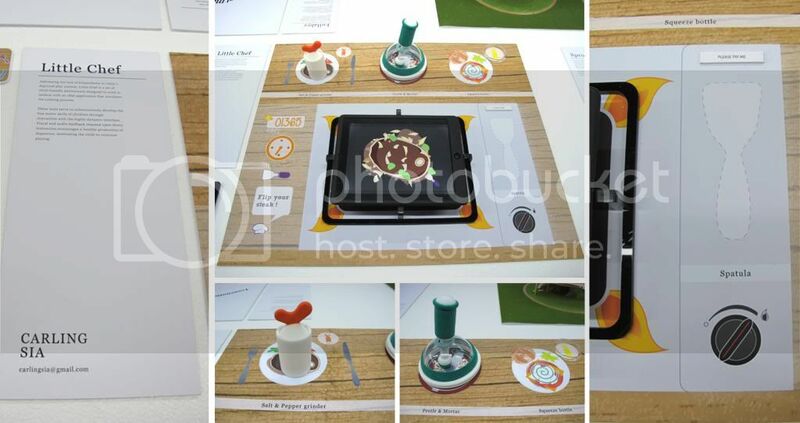 East- West fusion twist of the food! Yup, you guessed it, they have Pineapple buns, coffee paper cafe, Coffee egg tarts? what's not to like! Sorry, but taste wise, not that fantastic, would rather eat those in the bakeries. 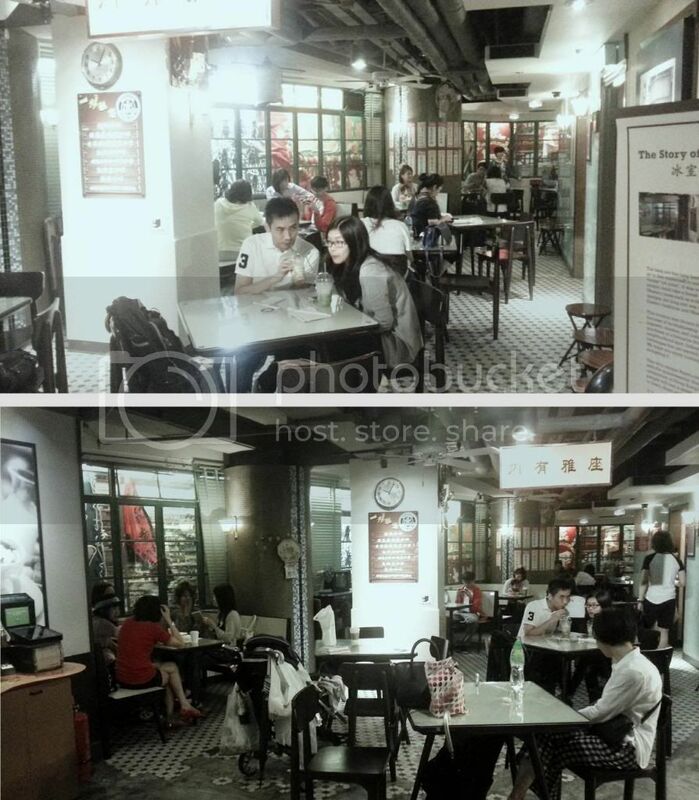 but at least these are traditional Hong Kong food that you can only find in these hong Kong Starbucks stores. 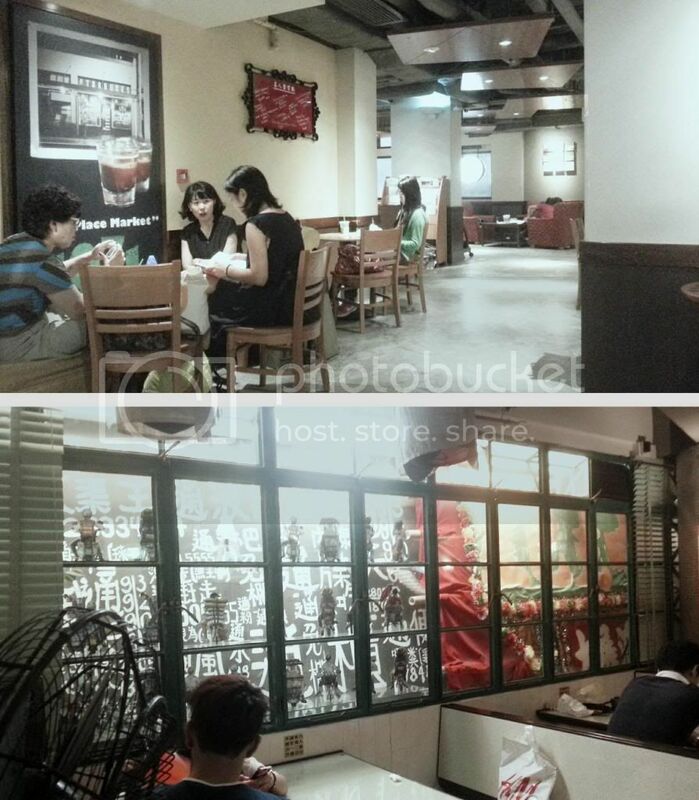 The second and latest Starbucks concept store is located at Sai Yee Street, MongKok. Although this store is also another collaboration with G.O.D, the design and outlook of the store is totally different from the one at Duddell Street. 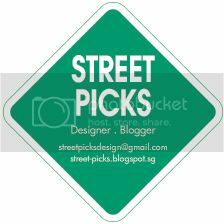 This concept store is built to reflect the cultural characteristics of Mongkok. 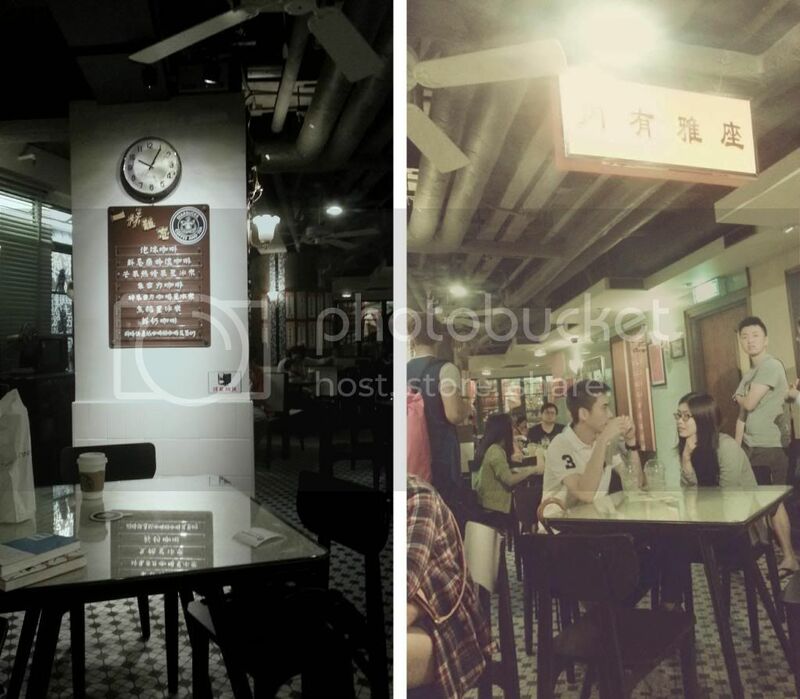 Hong Kong movies play a big role in the local culture, and its also one of the main elements of design for Sai Yee Street Starbucks. Decorated with photos of local people taken on the streets to old movie posters and contemporary arts that reflects the living heritage of old Hong Kong. 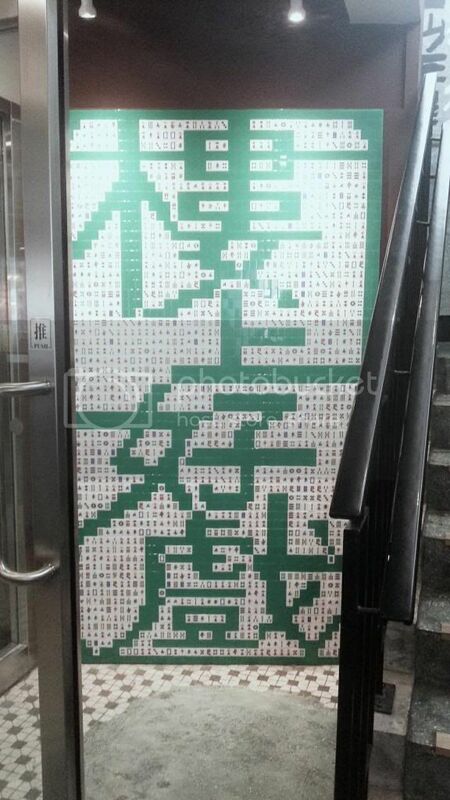 A sign that says 'More seats upstairs' made out of Mahjong tiles! 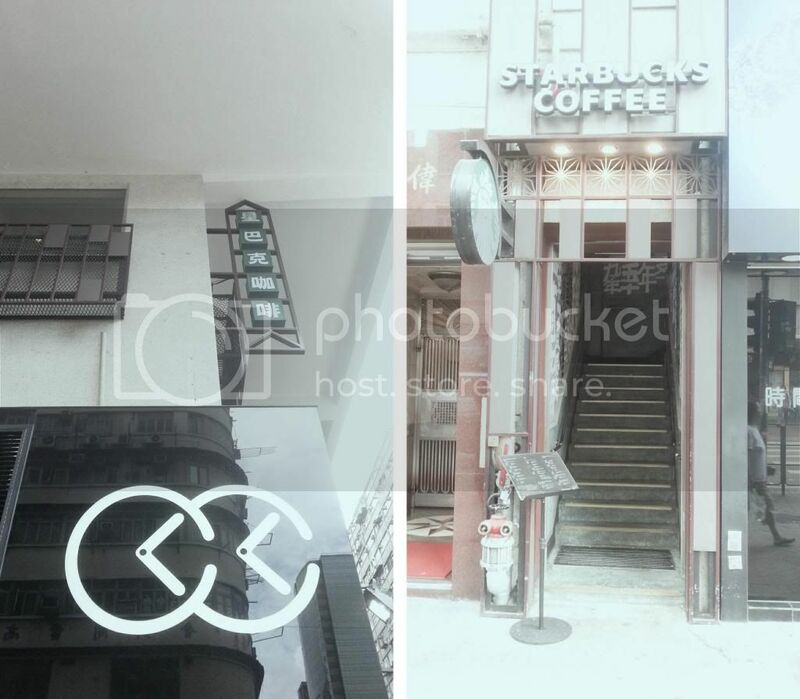 So if any of you guys are planning a trip down to Hong Kong, do drop by these 2 Starbucks and take a look. it would be an experience not to miss out on. PS: sorry for the bad quality photos. 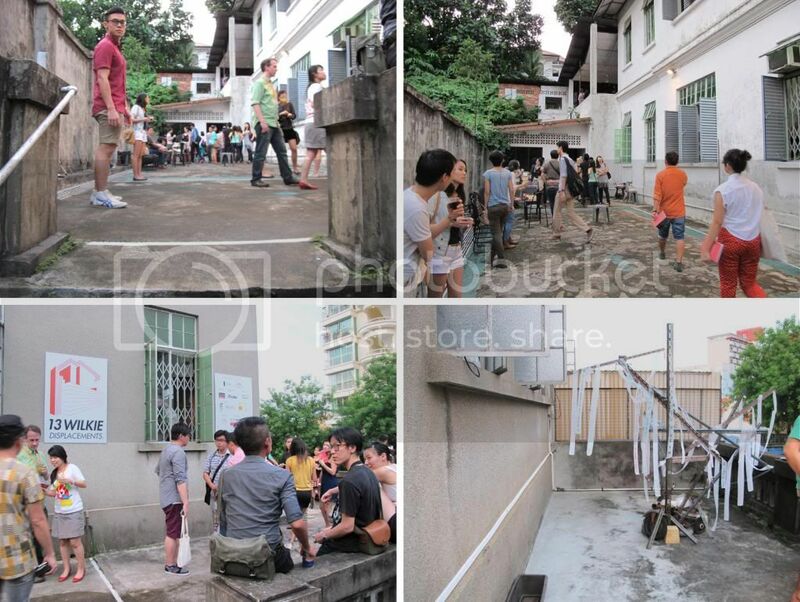 Last Saturday, We went for an event that was held in a 77 years old mansion up along the road of Wilkie Terrace. 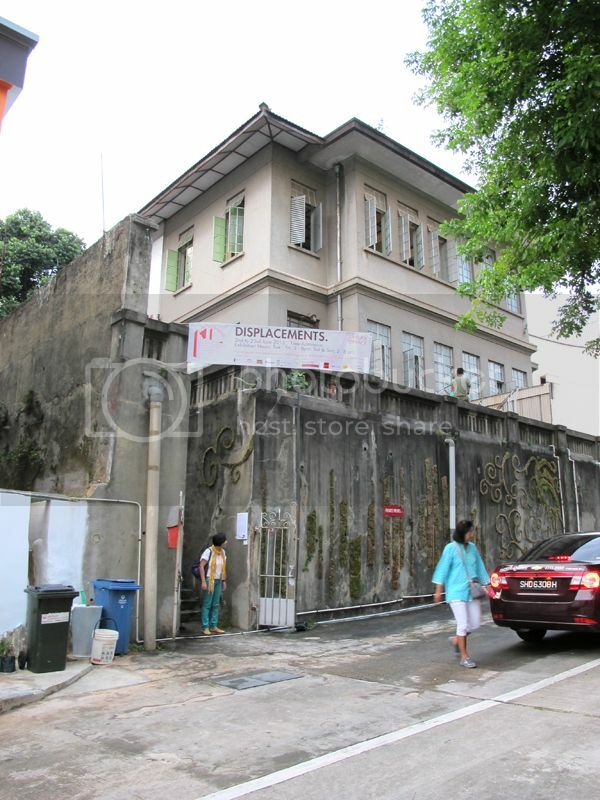 This house will be demolish to make way for an upcoming condominium. Which we felt that it was quite a pity, that we are progressing so fast into the future that we do not have anything solid to show, to teach our future generations of what and how was life then in Singapore. The theme of this event was "Displacement", due to upcoming luxury house that is going to be build on the spot, this forlornly looking house will be gone. Getting displaced of its own land 77 years later, hence the theme. 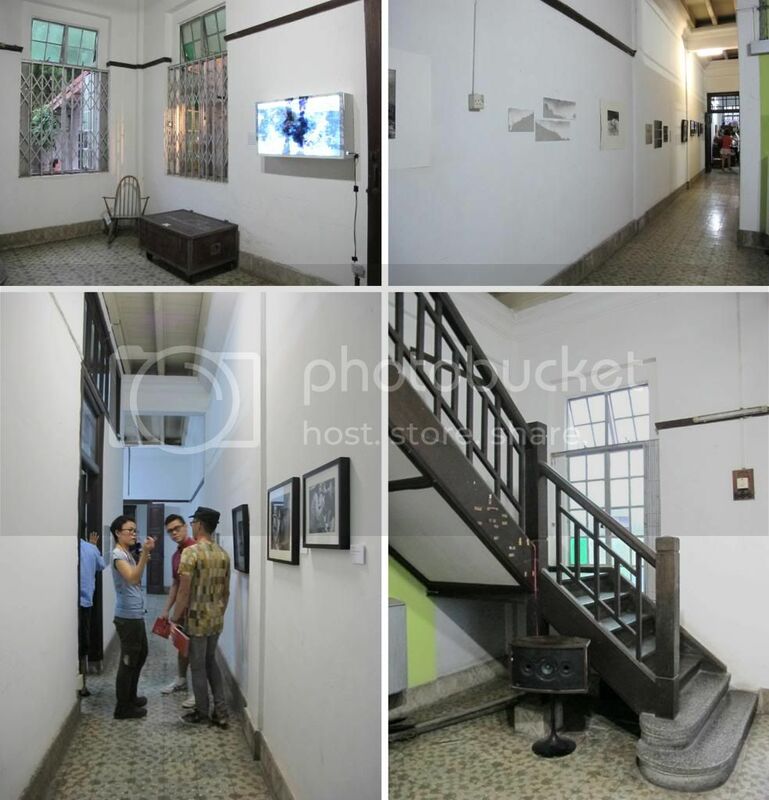 Inside the house, it consisted many works of various artists. Each expressing their understanding of getting displaced through the many different type of "mediums". Flea market was held to allow people to preserve some of the smaller antiques. 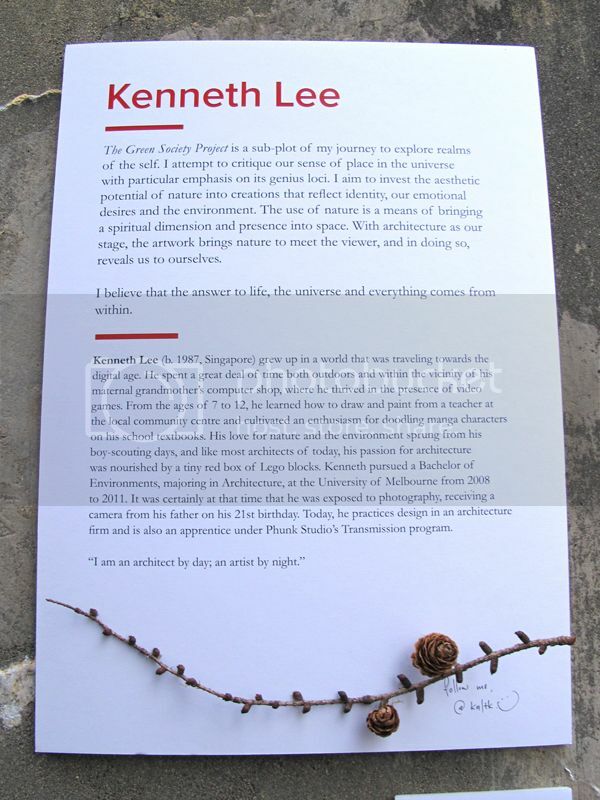 We were given a very thorough introduction of each work, got to understand those works better. The entire walk way was filled with various different emotions making the place quite gloomy despite the best efforts to keep the place lively. 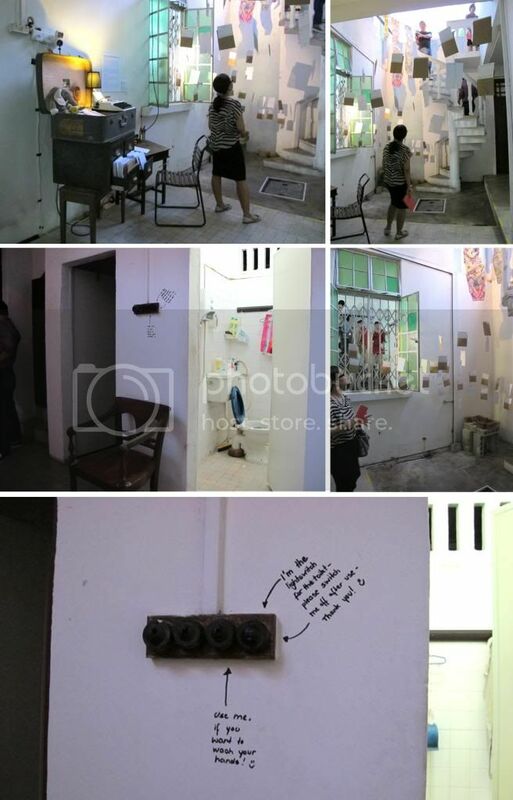 Perhaps everyone over there shared the same sentiments, the loss of a piece of Singapore's history, our history. 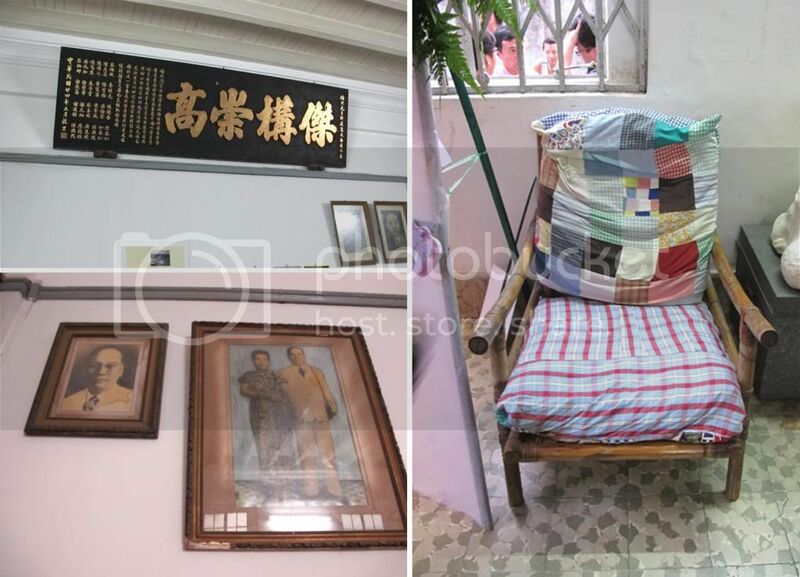 Beside the works that are on the wall, we managed to see some furnitures and products of the olden day. Which we are quite a big suckers to them, maybe that was how we have gotten our name. 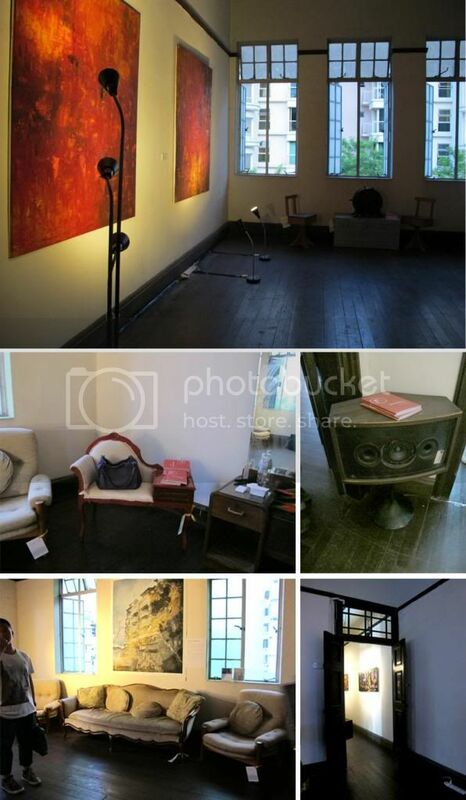 Products ranging from speakers to luggage to chair. They were quite nicely done up without anything superfluous to make them exist awkwardly like how some of the designs of today. They are still perform exquisitely despite the passage of time. Reliable and honest. Maybe if they are more appreciated by everyone, our city will not be filled with so much special objects that disrupt the balance of our life. Growing up in a house like this during my younger days, made me thought of my grandmother. Every Saturday morning, I would wake up early to buy her breakfast while she will still be doing her morning prayers. 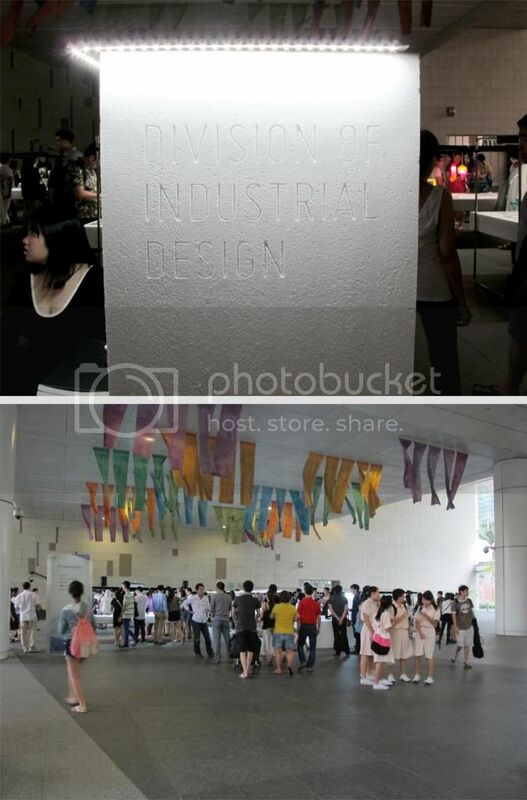 Last Saturday was the opening day of NUS, Department of Industrial Design graduation show. 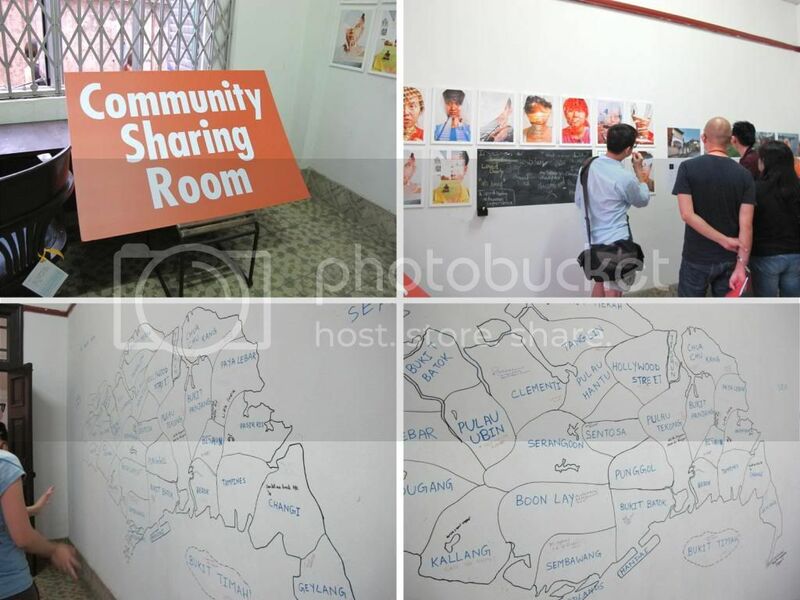 It is held at the National Library at Bras Basah. It's seem like it was broken down to 3 sections, the conceptual on the left, the production methods in the center and the medical on the right. The show has a very light feel to it, minimal props allowing the works of the graduating students to stand out prominently. Our favorite piece of work during the graduation show, Charcoal things, there is this subtle humor to it and we felt it was nicely done. 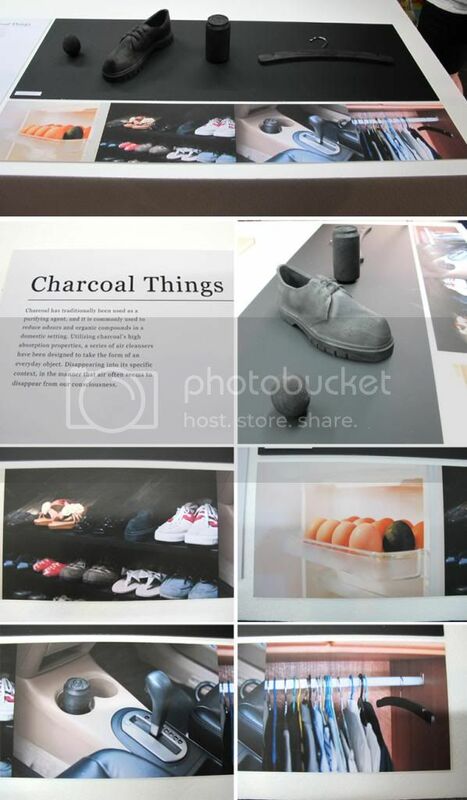 It has complimented the concept so perfectly of eliminating the form of charcoal that we were all once so familiar with. Not only that, it has blended into their own surrounding without attracting any unwanted attentions or disrupting the balance of the atmosphere of the surrounding. Chindogu, A Japanese art of inventing unorthodox solutions to solve daily problems. If I were to translate it in, it will be quirky. Personally I really like Watermelouth the most, allowing me to enjoy my watermelon without breaking it to create an additional piece to hold and throw. Rekindle, a simple rocker with the mechanism to allow paraplegics the ability to feel movements and sensations that were once lost. The swinging motions encourages intuitive exertion of trunk muscles needed to train balance for everyday activities. So simple but yet so functional. 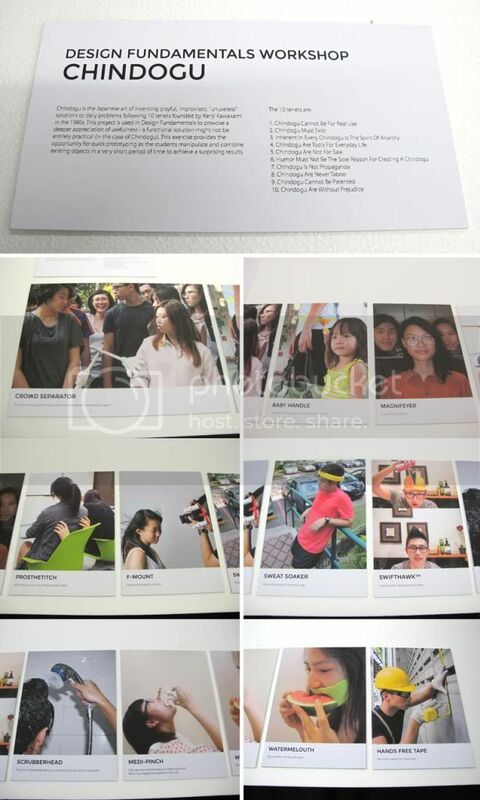 Well, personally we quite enjoyed ourselves over at NUS Industrial design graduation show, great snacks to top it off. Managed to learn some new stuffs from a couple of them. We would like to congratulate all of them. 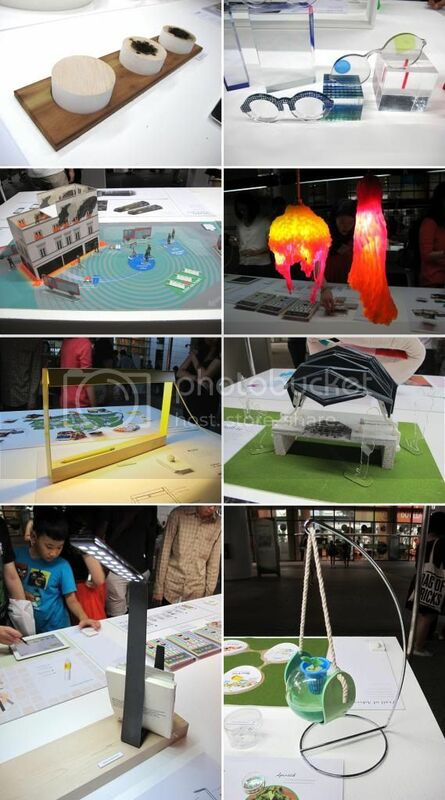 It was such a great idea for the event to be held at the National Library, having it staged in a general place allows the public to know and touch more on design. 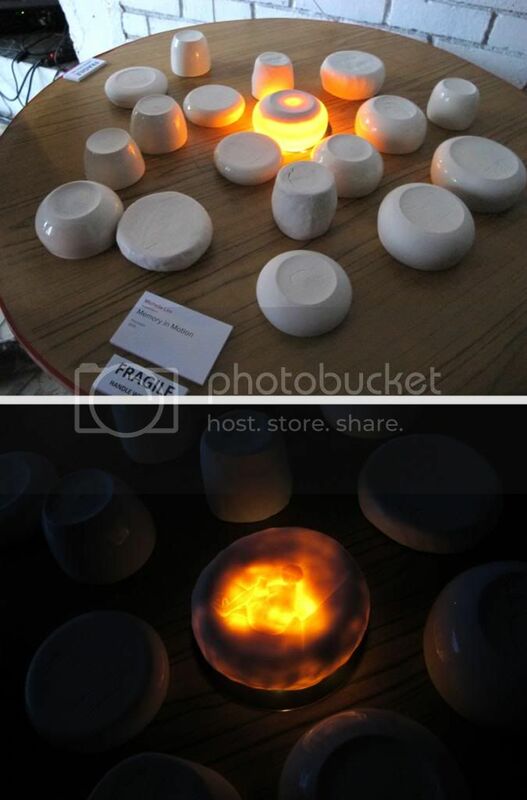 It can also be a medium, a platform to inform public, the future generation that design do exist within Singapore too.